← Vitamin supplements for kids: what are we really treating? Jacqui Webster receives funding from the Australian National Health and Medical Reaserach Council and the World Health Organization. Elizabeth Dunford has received funding from the National Health and Medical Research Council, Sydney University and Bupa Australia. Most of the salt consumed in Australia is already hidden in processed foods and meals, but there are some simple steps you can take to avoid eating too much of this palatable seasoning. 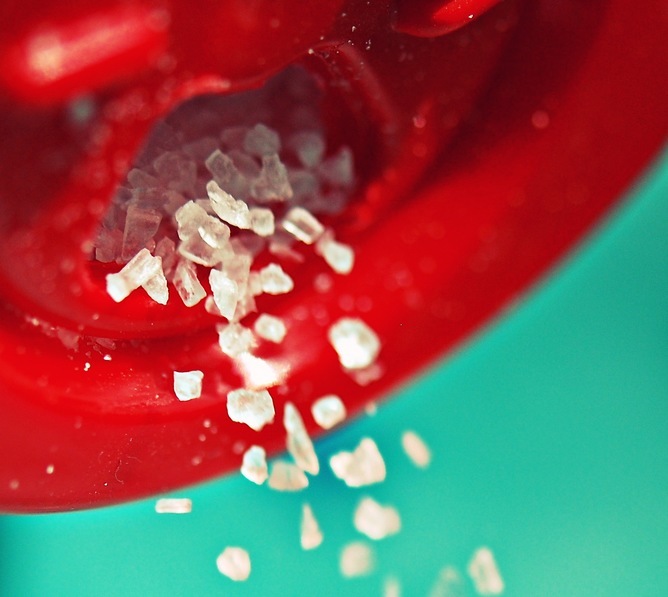 High salt intake is implicated in a variety of health problems, most importantly, in raising people’s blood pressure. High blood pressure is a leading risk factor for cardiovascular and kidney disease. Salt may also play a role in other health problems, such as osteoarthritis, cancer, asthma, Ménière’s disease and obesity. Lowering your salt intake will improve your health and reduce your risk of experiencing these problems. 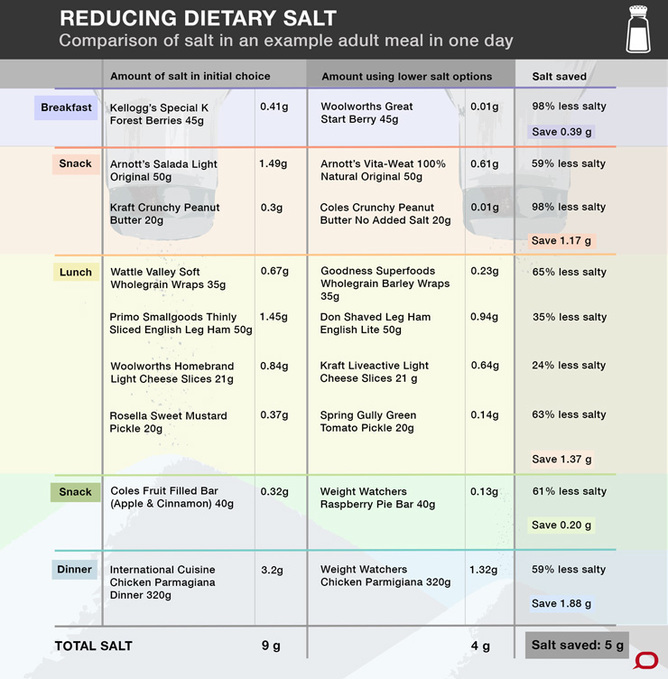 The average salt intake for Australians is around nine grams each per day, well in excess of the one or two grams per day required for good health and the World Health Organization’s (WHO) target of five grams a day. 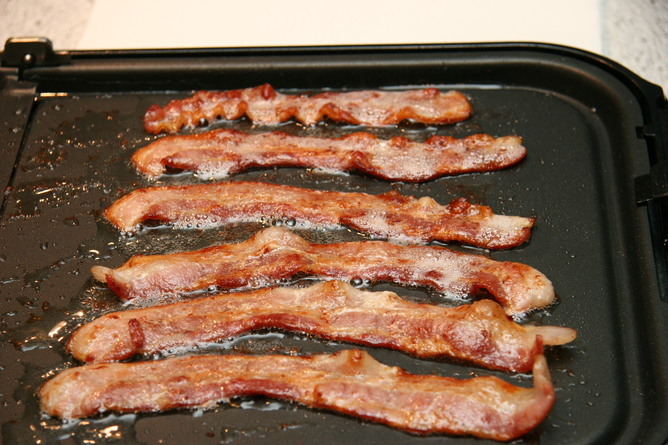 Current Australian guidelines include a suggested dietary target of four grams and an upper limit of six grams. This is less than one teaspoon of salt a day and it means the majority of us need to cut consumption by at least half. But you need to be aware of more than just the salt added to food during cooking. Around 75% of the salt we eat is already in the foods we buy, and it’s not always obvious where it’s hiding. People are often unaware, for instance, that bread is one of the biggest culprits for their high salt intake. Recent studies have shown that around 19% of salt in the Australian diet comes from bread; and the bread and cereals group together contribute 32.5%. For no particular reason, Australian bread products are saltier than those found in the United Kingdom and New Zealand. Other major sources of salt are processed meat products such as salami, sliced sandwich meats and canned meats (14.4%) and convenience meals, such as pizzas, sandwiches or stir-fry dishes (8.4%). And be careful if you pass on the salt but pour on the sauce – many sauces and condiments contain a lot of salt. Recognising the high contribution of processed foods to Australians’ dietary salt intake, the federal government established the Food and Health Dialogue in 2009 to improve the food supply. So far, the dialogue has developed targets for the maximum levels of sodium that food manufacturers should aim to achieve in bread, ready-to-eat breakfast cereals, simmer sauces, processed meats, soups, savoury pies, savoury crackers, and savoury snacks. But the initiative has attracted criticism from public health groups because of its slowness and lack of accountability. 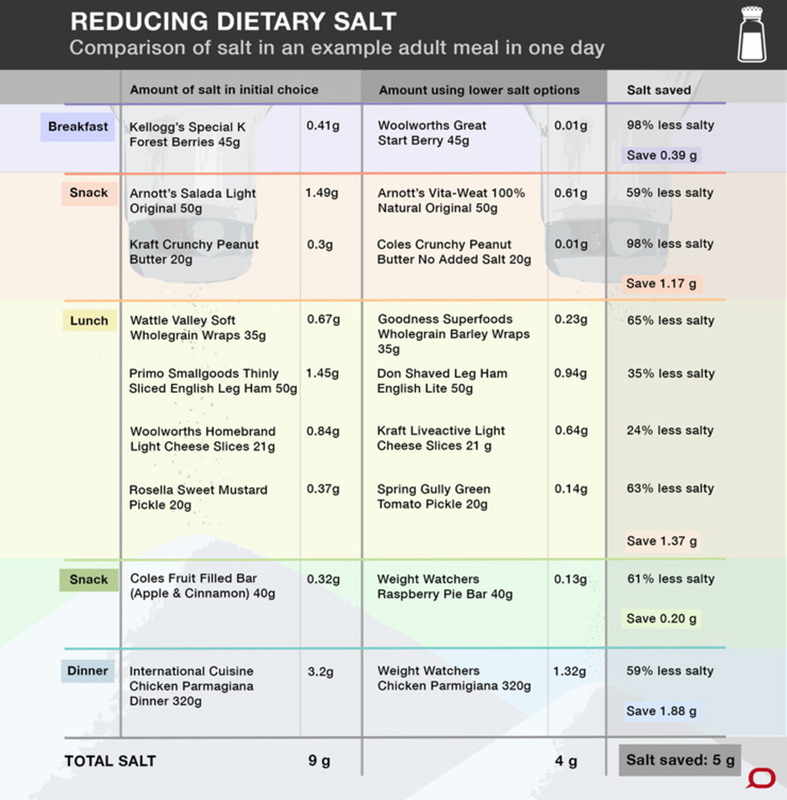 Despite other countries, such as the United Kingdom and the United States, setting salt reduction targets for more than 80 categories of food in a relatively short time frame, only 17 targets have been set in Australia since the dialogue was established over five years ago. What’s more, existing evidence suggests that adequate reductions are not being made. Previous studies on changes in salt levels in bread, ready meals and pasta sauces, show little evidence of systematic reductions. And even if all pasta sauce manufacturers meet the dialogue’s voluntary commitment by the end of 2014, average salt levels in Australian pasta sauce products would still be above other international targets. While this demonstrates a clear need for government to ramp up its efforts, individuals can also make simple changes to cut the salt from their diets. The easiest way to lower dietary salt intake is to eat fresh, unprocessed foods and limit your intake of processed snacks and treats. Nutrition labels in Australia indicate how much sodium (the unhealthy part of salt) a product contains. To calculate the salt content of a product, you need to mulitply the sodium content by two and a half. A low-sodium food contains less than 120 milligrams of sodium per 100 grams (or 100 millilitres) of food, while a high-sodium food has more than 600 milligrams per 100 grams (or 100 millilitres). Eating less salt doesn’t mean what you eat will be less tasty. A lot of people who move to a low-salt diet discover they prefer the wide variety of flavours that salt used to mask. Taste buds adjust very quickly so after only a few weeks eating less salt, you’ll become more sensitive to the salt in food, and won’t even notice a difference. But it will make a difference to your long-tern health.